My second ground of 2015 was on Saturday 24th January at the Beveree Stadium in Hampton, London. The match was Hampton & Richmond Borough vs. Dulwich Hamlet in the Isthmian League Premier Division. 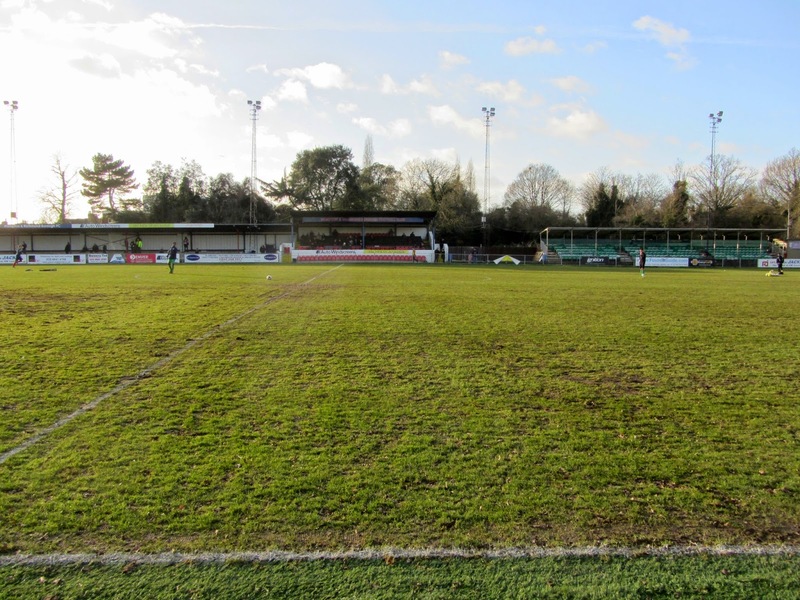 The Beveree Stadium is located in the suburb of Hampton close to the banks of the River Thames. It is surrounded by a mixture of green space, residential properties and a school. 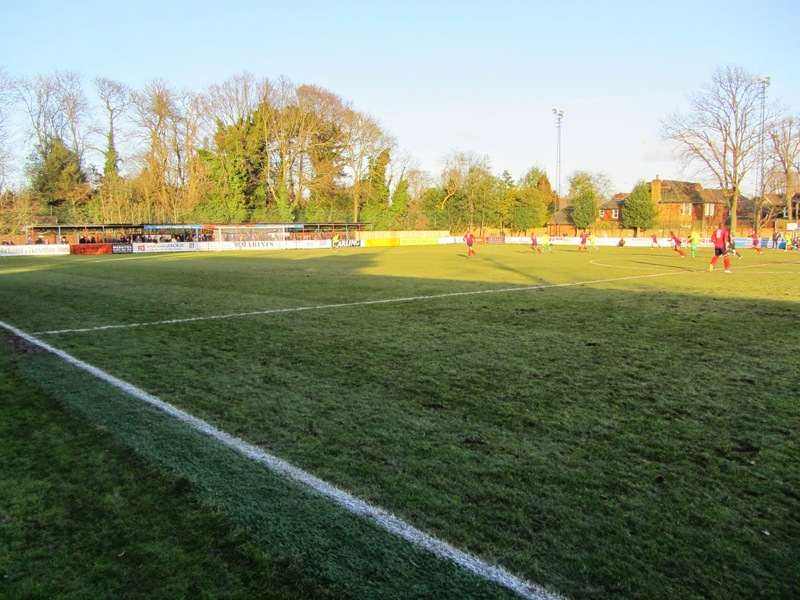 The ground is half a mile east of Hampton railway station and has been home to the club since 1959. The Beveree Stadium has a real mixture of viewing areas - on the western side of the ground there is a covered concrete terrace which runs from the south-west corner to near the half-way line. Attached to this is a seated structure with room for around 200 fans. The section where the two areas come together also contains a kid's food outlet. An additional semi-permanent all-seater stand was added to this side of the ground in 2008 in order to satisfy ground grading requirements. The southern side of the venue saw a lot of improvements during the mid-2000s. In 2006 a renovated club house and changing rooms were completed and work was also done on the turnstiles during this period. Directly behind the goal is the Alan Simpson Stand, another all-seater structure able to seat around 100 supporters. The eastern side of the ground mostly consists of uncovered standing though there is one covered section about a quarter of the way along from the southern goal. The dugouts are situated on this side of the venue. The majority of the space behind the goal at the northern end is taken up with a covered standing section though there are uncovered standing sections either side of this. 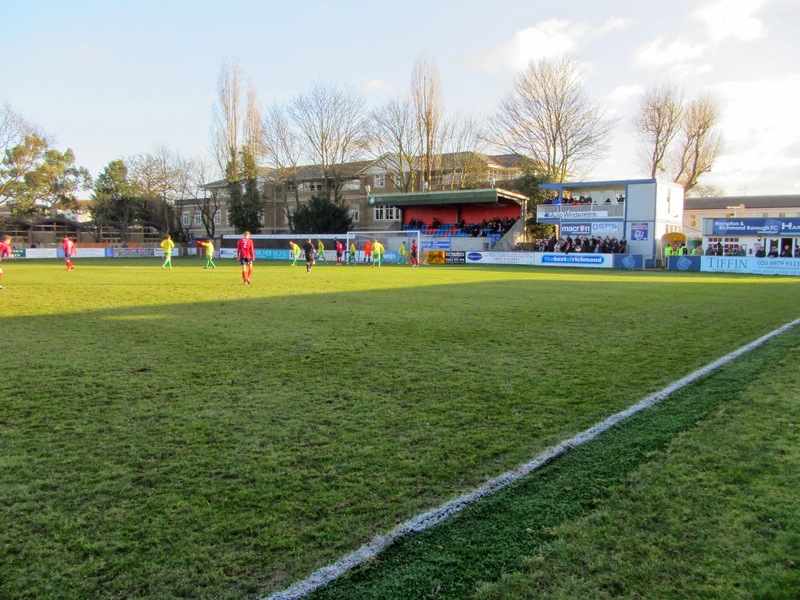 The two sides came into the game off the back of varying form with Dulwich riding high having won six of their previous seven while Hampton & Richmond Borough had only picked up one win from their previous eight games. The visitors had the best of the early play and almost scored in the 35th minute when Nyren Clunis stuck the post from close range. In the 40th minute the ball found its way to Hampton's Charlie Moone on the edge of the Dulwich box and his smart turn gave him space to knock the ball into the bottom corner to give the hosts the lead at the interval. The muddy pitch deteriorated in the second half slowing the game down and this seemed to particularly Dulwich. They came closest to a goal with 10 minutes to go when there was a scramble in the Hampton penalty area but the ball was eventually scooped away and the home side hung on to win 1-0.